In a magnetised fusion plasma (a hot, charged gas), one of the most difficult properties to determine is the local current density. This density, however, plays an important role in the stability of the plasma. Instabilities can arise dependent on the distribution of the current density in the plasma. These instabilities can lead, for example, to brief energy outbursts of the plasma in the form of Edge Localized Modes (ELMs). Scientists have developed various diagnostic techniques to measure the overall current density distribution in the plasma. However, a good solution has yet to be found to measure the local current density. To that end, DIFFER has developed a powerful measuring system for the German tokamak ASDEX Upgrade in close collaboration with the Russian Ioffe Institute and the German Max Planck Institute. The system is based on Thomson scattering, the process in which a charged particle scatters electromagnetic radiation. Normally researchers use Thomson scattering to measure the electron density and temperature (from the intensity and width of the scattering spectrum respectively). 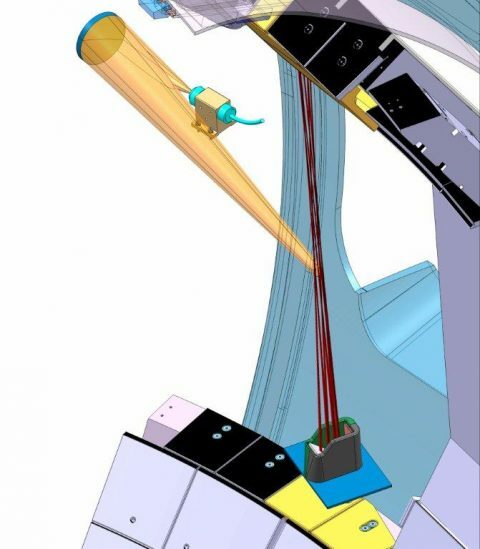 Now, by making a system with a very high effective laser capacity, the researchers can also use the Thomson scattering diagnostics to determine the local current density in the plasma . They do this by examining the wavelength shift of the entire spectrum. The researchers expect to be able to determine the small shift of about two nanometres with an accuracy of ten percent despite the large width of the spectrum (200 to 300 nm). The new system achieves the required high effective laser power by capturing the plasma in the cavity of the laser. The laser pulse moves up and down through the plasma about twenty times. As a spectrometer can make no distinction between individual laser pulses, it effectively sees one long high power laser pulse. The light is subsequently led back to the crystal of the ruby laser, where it once again increases in strength. With this approach the system produces a train of pulses at 10 kilohertz within the flash tube period of 10 milliseconds. Each individual pulse has an energy of 15 Joules. The laser beam (red) is reflected many times between a mirror on the upper side (not visible) and another on the lower side, protected by a Brewster window (in the green holder on the lower side). The collecting lens and the optical fibre that must convey the light to the spectrometer are shown at the top left.